Traci Lynn Johnson vs Raychel Coudriet - Who's More Popular? Traci Lynn Johnson vs Raychel Coudriet – Who’s More Popular? Over the past couple of days, I’ve written about both the Tiki Barber affair with Traci Lynn Johnson and also the new Tiger Woods mistress who is Raychel Coudriet, and for some reason I’m thinking that Traci Lynn Johnson is actually the bigger story. I only have my web analytics to go by here, but I use Get Clicky which gives me real time traffic data and I see Traci Lynn Johnson at the top of my search que constantly, but I don’t believe I’ve seen Raychel Coudriet there more than a handful of times today. Looking at a screen shot from my Google Analytics also proves this (to a degree anyway). 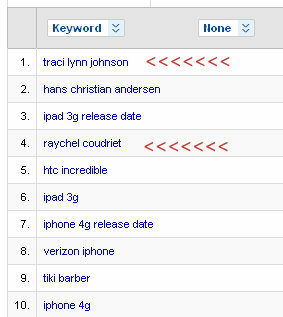 Traci Lynn Johnson is the #1 keyword phrase searched over the past 30 days, and I only wrote about her a few days ago. The same is true about only writing about Raychel Coudriet a few days ago as well. I would have certainly believed that the Tiger Woods story would have been a lot more popular than the Tiki Barber story, but if my analytics are any indication, this is not the case. Or perhaps it’s that the Tiger Woods story is being dominated by The Masters and his return to golf, and maybe people just don’t care anymore how many mistresses he had in the past. And maybe Tiki Barber, being new on the mistress story scene, picked up a lot more momentum than Tiger Woods.